Jo ingeniously marries the idea of a good sing with a kind of healing thing. She pays an almost forensic attention to the different parts of your voice - the head, chest and belly. When I worked on a documentary show recently where I had to sing two songs at the Jazz Café for the denouement, I found Jo’s daily warm ups an inspiration. Enjoy this book - it’s good for your soul!" "Jo is both intellectually and emotionally connected to the human voice in all its capacities from speech to song. This is why she is interesting and interested in all the nuances the voice has to offer. Jo is way ahead of the pack and this fact keeps her lessons informative and inspirational." "Find Your Voice - The No.1 Singing Tutor"
"Should be on the shelf of every singer, no matter what style, professional or amateur." ‘Find Your Voice - The No.1 Singing Tutor’ is the fully revised and extended edition of this classic, best-selling singing book. 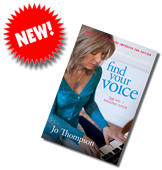 ‘Find Your Voice’ is the ultimate user-friendly guide to singing and the voice for singers of all styles and abilities. In this extremely approachable and practical singing tutor book you will discover how to breathe properly, develop a sound singing technique, unlock the potential of your voice, audition and perform successfully, develop the perfect practice regime, and warm up your voice effectively. 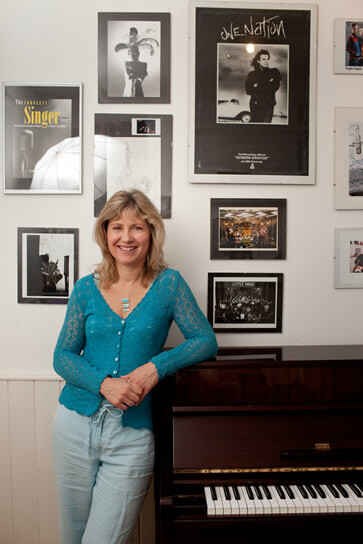 Jo has produced an invaluable introduction to Jazz and Blues to be used alongside her singing exercises and warm ups. These are not technical exercises as such, but serve as an introduction to the basic scales, chords and modes most widely used in Jazz. The more familiar you are with these patterns and the more you get your 'ears' around them, the easier it will be for you to improvise when singing or playing Jazz or Blues. In addition, practicing these patterns regularly will give you more freedom when performing other styles of music. Instrumentalists can practice the exercises on their own instruments. Singers can also use them as a warm up. As well as the exercises, there are some backing tracks for you to practice the various patterns over, with specific examples of scales or modes that fit with particular chords. 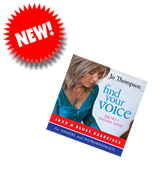 Jo has recorded for download some of her favourite singing exercises to accompany her best-selling book `Find Your Voice - the No.1 Singing Tutor’. These invaluable and enjoyable collections - available for either male or female voice - are appropriate for singers of all styles and abilities. The exercises are designed to improve your breath control, strengthen your voice, increase your range, develop your tone and resonance, gain an understanding of your registers, and increase your vocal agility. Jo introduces and demonstrates each exercise and then provides a piano track to practice with. It is very important to warm up before doing any singing. Warming up properly will help you achieve your best vocal performance and is also an essential part of vocal maintenance. By popular request, Jo has produced these must-have Vocal Warm Ups (available in both male and female versions). These exercises can be used as a general warm up before any rehearsal, performance or recording. They can also be used as part of your daily routine to help strengthen your voice, improve your vocal technique, and generally keep your voice in shape. Do you ever wish you had the confidence to stand up anywhere, anytime, with anyone and just tell your story? Would you like to increase your personal impact when communicating or presenting? If so, ‘Communicate With Charisma’ is the book you’ve been waiting for. In this book you are offered secret tips and techniques used by professional communicators such as public speakers, actors, comedians and singers to help you dramatically increase your personal impact in life and at work. Click here to buy the paperback from Amazon.